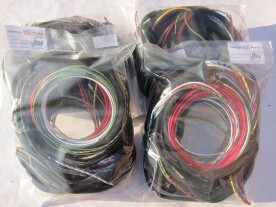 A variety of models in stock or supplied to order, to include NA/NB, other Magna and Magnette models plus TA/TB/TC including panel harnesses. Importantly, VMGP's custom looms incorporate additional wiring for indicators to all 4 corners which the customer may or may not wish to use. All our looms are in correct colour and original style cotton braided 1930s style wires and coverings. Cable wires, where appropriate, also have bullet end and eyelet fittings.